On September 26, Southwestern Airlines’ flight 3357 to Florida took off from Lambert-St. Louis International Airport. About 20 minutes into their flight, while above Tennessee, a flight attendant noticed something unusual to the far right. Fortunately, she had enough time to take out her phone and start filming. About 15-20 minutes into our flight I noticed what I thought was another plane and all of the sudden whatever it was did a 180 without losing altitude or speed. I could only see two contrails but no object." The UFO appears to completely change direction mid-flight and this is evidenced by the trails left behind by its propulsion systems. 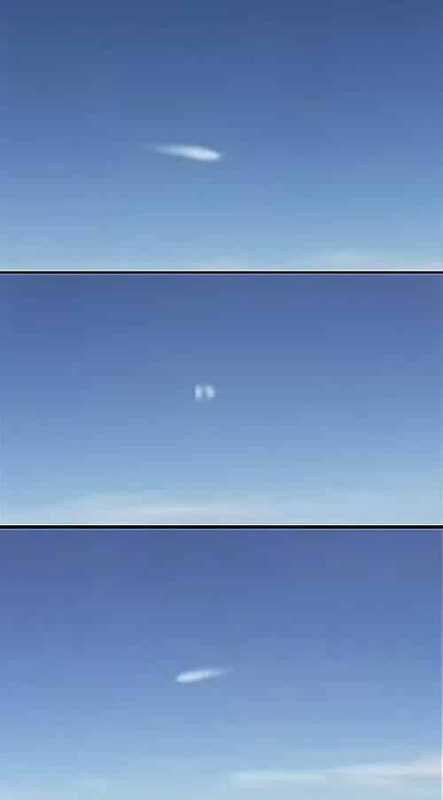 In less than 15 seconds,the UFO completely changes its direction. It is difficult to estimate the size of the unidentified flying object and we can only guess how far it was when it executed the seemingly impossible maneuver. But two things are certain: it isn’t small and it isn’t slow. It also seems to exhibit capabilities far superior to those of any known aircraft which would suggest that it is either extraterrestrial in nature or perhaps one of the ultra-secret military prototypes that we’ve been hearing so much about lately. If the pilot of a large commercial airliner such as a Boeing 747 attempted to perform a 180 degree turn, the aircraft would undoubtedly disintegrate so we can safely rule these out. I was shocked as I’m a flight attendant and have never witnessed anything like this before and my husband also saw it. He’s flown every week for the past 25 years and has never seen anything like it." Skeptics would argue the object is nothing but another aircraft leaving behind contrails and that the apparent 180 degree turn was the result of the two planes crossing paths. They argue that when the filming plane crossed the wake of the other plane, a perspective change gave the false impression that the latter performed an impossible maneuver. However, this hypothesis has one major flaw: the FAA’s strict rules. In order to avoid mid-air collisions and prevent the loss of hundreds of lives, the Federal Aviation Administration imposes rigorous regulations and almost never allows two aircraft to pass this close to each other. Furthermore, the strange incident was witnessed by the flight attendant’s husband, a commercial airplane pilot with over 25 years of experience and thousands of flights under his belt. It’s unlikely he would have made it this far if he couldn’t recognize another airplane when he saw it. This sighting will most likely remain unexplained, like many thousands before it. We’ve already grown accustomed to this phenomenon but the good news is things are probably going to change soon. At some point, someone with the right credentials will have to step forward and come clean, blowing the lid off this secrecy once and for all. Until then, keep watchful and remember not to believe everything they tell you!